He hardly needs an introduction: Lawrence Power, British violist, educated at Guildhall and Juilliard. Having won the Primrose International Viola Competition in 1999, Power enjoys a prominent carreer as a soloist and chamber musician. His CD recordings are widely acclaimed, spanning particularly the 20th century English viola repertoire in addition to the landmarks of Hindemith, Shostakovich and Bartok. He is International Professor of Viola at the Zurich Hochschule der Kunst. This month, Lawrence is visiting Rotterdam for two performances with his pianist Simon Crawford-Phillips, and a viola masterclass sponsored by Codarts and the Dutch Viola Society. A perfect pretext for an interview, and we were fortunate to find Lawrence available for a telephone conversation on a rare quiet evening. DVS: How did it all begin, was there music in your life from the very start? Well, I’m not from a musical family, so I was very fortunate with my local school, where they had tests to see if children were musical. I was quite tall for my age, so I started straight on the viola when I was seven. DVS: Did you ever want to become anything else than a viola player? No, it was really something that I always wanted to do, it was very natural. DVS: So, at such a young age, could you get an instrument with a decent sounding C-string? I can’t really remember, it’s so long ago! But in a way, a viola can sound better in the beginning than a violin; some of the beginners’ violins can sound, you know, quite strange… so maybe that’s why I liked the viola. And when I was 12, I was very fortunate to get a good modern viola. So I was lucky to have a good working instrument early on, that makes a big difference. DVS: Which teachers and performers inspired you in your development as a musician? I had a great teacher from the age of 12 till 19, Mark Knight in London. He was a very practical teacher – a violinist actually, more than a viola player. And of course, being interested in viola, I listened to recordings of William Primrose and Lionel Tertis. And Yuri Bashmet, who was already a big superstar when I was young. And I listened to other musicians like Oistrakh, Heifetz, Milstein, all these wonderful historical recordings. So, lots of influences really. DVS: Do you observe any rituals related to concert performances? No, I really try to be relaxed about that. When you travel all over the planet, and you find you can’t keep to your rituals, it would be quite unnerving, if you’ve come to depend on it. When I’m at home, I can lock myself away and practice for 12 hours a day to prepare for a concert. But when I’m on the road, I might not get any decent practice for a whole week. That kind of flexibility is important for a musician, rather than routines. For me, anyway. DVS: Not so many superstitions, then? DVS: Given an opportunity to play just one unaccompanied viola solo piece, what would you play? Difficult question… well, it wouldn’t be Bach; I don’t play Bach on the viola. I could play a Hindemith sonata… or the Ligety sonata, which is a great piece of music. Or the Berio Sequenza (for viola, numbered VI, ed.). Yes, I think that’s it: Ligety or Berio. DVS: What’s wrong with playing the Bach cello suites on the viola? Well, for one, he didn’t write them for the viola. And – I don’t know if I should be saying this here – but I actually play quite a bit of violin lately, I adore baroque music, but as a violist I don’t get in touch with that repertoire very much. In terms of playing Bach, I’d rather work on the violin sonatas and partitas. For baroque music, it’s wonderful to have the violin in my life, with access to composers like Biber, Schmelzer and Bach. DVS: You do not find it difficult to switch between violin and viola? No, to me the mechanics of violin and viola are much the same. Although I started out on the viola, I’m not a viola purist. It’s like a language. The viola is my mother tongue, I adore the viola, it’s what I do. But it’s possible to speak other languages, even if perhaps you have an accent. The words you say are more important than the accent. William Primrose was one of my favourite viola players, but he was a violinist first, trained by Ysaÿe; Pinchas Zukerman was a violinist, even Lionel Tertis started out a violinist. It is important, even if you only play the viola, to have a solid technical grounding. Then you can play whatever you want. But the most important thing is that you have something to say. DVS: In Rotterdam you will be contributing to a dance performance, based on the Shostakovich viola sonata. How did that come about? I was asked if I would stay on in Rotterdam (after the recital of Oct. 20th, ed.) to do this ballet performance based on the Shostakovich sonata. It is a wonderful piece of music, but also a very dark piece, very challenging for the audience. It is just about the last piece he wrote before he died, he never heard it performed. The opportunity to work with dancers on such a piece can be very interesting, and I’m very curious how they have choreographed it, it might give an added dimension. After the Shostakovich we will also be playing some recital repertoire, without dancers. DVS: You seem to have a certain affinity with the British composers surrounding Lionel Tertis; your York Bowen recordings in particular seem to carry a personal conviction. How would you introduce Bowen to an un-initiated audience? I would introduce Bowen to the audience as a very important English composer of real skill, who wrote many great works for the viola. I was very fortunate to be asked to record the Bowen viola concerto on Hyperion. And that went down very well with the public, so I had this idea to record all of Bowen’s viola music, which he wrote for Tertis. Bowen was a superstar in his day, he premiered works at the Proms every year. And then after the wars, his music went out of fashion. He was overshadowed by composers like Elgar, Britten, and Vaughan Williams. For a young violist today it would be crazy to ignore Bowen’s pieces, because they show the viola in a very heroic and virtuosic light. And as a viola player you need those pieces in your repertoire, otherwise your concert programmes can become very one-dimensional, with elegiac music. In Holland of course you’ve also got some wonderful viola composers to choose from, like Röntgen. DVS: How much of Bowen’s appeal can be attributed to the enormous viola passion of Lionel Tertis, shining through? Oh, a lot. Tertis was one of the first viola players ever to travel around the world, as a soloist. Not only Bowen, but just about all English composers wrote for him: Walton, Holst, Vaughan Williams, Bliss, Bax … so in a way, like Rostropovich was a big figure for the cello, Tertis was massively important for the viola repertoire of the early 20th century. DVS: The contemporary viola repertoire is growing at an astonishing rate, left and right you see viola festivals, viola ensembles, viola societies popping up. Why is this, what is the particular appeal of the viola in our time? Musically speaking, composers in the 20th century have reacted to the viola, because they see its possibilities as an expressive instrument. Of course Mozart, Schubert, Dvorak – they all played the viola, because as a composer of chamber music, you need to understand that middle voice. The viola turns the keys for a chamber ensemble. Hindemith led the way for future composers to write viola concertos. And also, for a composer considering to write a violin concerto, you feel the weight of a massive tradition on your shoulders, so a viola concerto perhaps feels liberating. Regarding the Viola Societies, I think it’s great that people feel strongly about that, but I think the musical attraction of the viola has more to do with the versatility, the variations in size, shape and sounds that it can produce. DVS: So then, analogous to composers’ preference for viola over violin concerto, might one explain the increase in repertoire for viola ensembles (at the expense of string quartets)? Well, as long as it’s a good piece of music, the particular instrumentation is of secondary importance: Four flutes, violas, whatever. Of course Bowen wrote a viola quartet, and there’s a wonderful viola duo by George Benjamin: “Viola, viola”, a very powerful piece, which I’ve played many times. Hopefully, people will write lots of new interesting works for the viola. DVS: Any prospects for the near future that you are particularly excited about? Luckily I have lots of fun things to look forward to every month, travelling around and playing with nice people! But the main thing I’m really looking forward to now is the premiere in January of a new viola concerto by James MacMillan, in London. Working with contemporary composers is a big part of what I do and something I really enjoy. 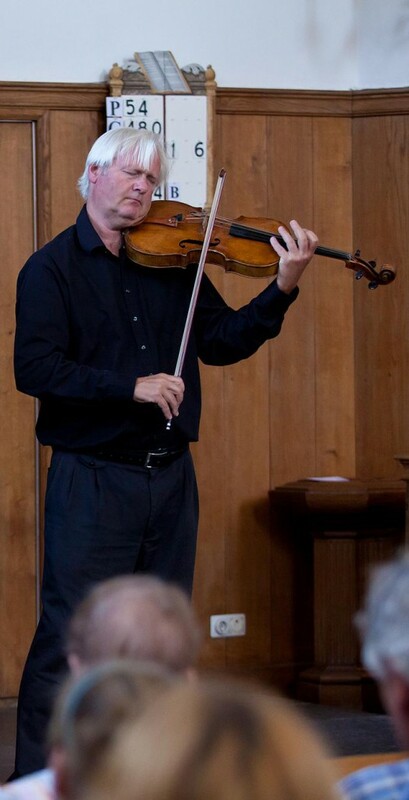 The “Norwegian Giant” Lars Anders Tomter is widely regarded as a world class violist. 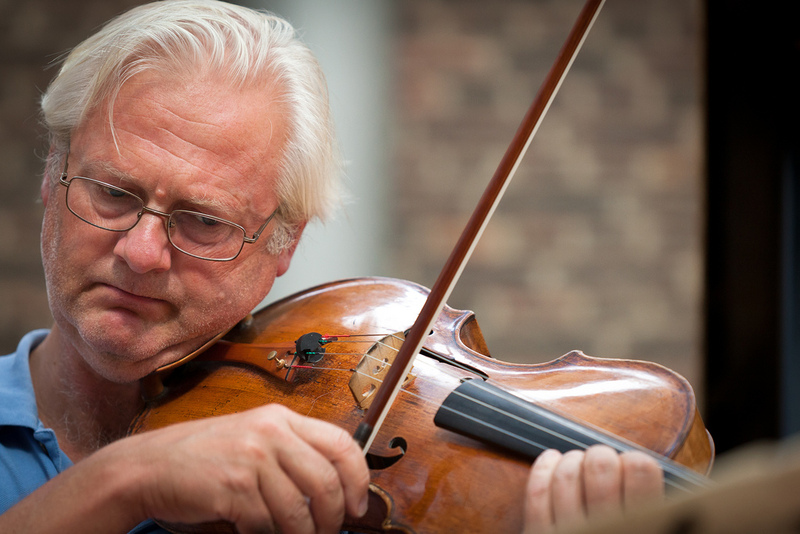 Last month he played at the Delft Chamber Music Festival, and the DVS was lucky to find mr. Tomter prepared for a chat about the festival, his role as a violist and the development of viola repertoire. DVS: You have been coming to the festival in Delft for quite a few years now, haven’t you? Yes, this must be at least the fourth time. DVS: What sets the Delft Chamber Music Festival apart from other festivals? Every festival has its own character, and Delft has a lot of it. For one thing it is due to the very special location, a town which is worth the trip regardless. 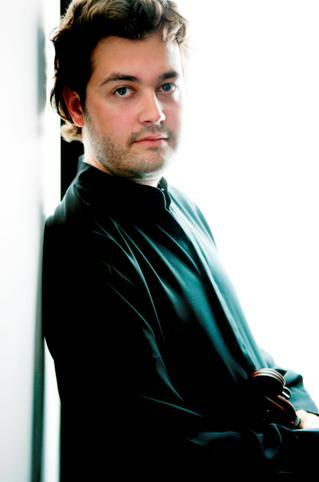 Secondly due to Liza [Ferschtman, artistic manager], whom I value highly, a fantastic musician and a wonderful person. Easy to get along with, clear but flexible, both in her musicianship and in her general demeanour. So it’s both the place, with its audience, and the artistic leadership. DVS: Liza Ferschtman explains that she consciously invites individual musicians rather than fixed ensembles to this festival. As a consequence, the programming features many pieces from the fringes of the chamber music repertoire, with unusual casts such as quintets and sextets. Does this agree with your own preferences? That’s indeed the key idea. I also run a festival like this, in Risør [Norway]. Such a festival is a bit like a family gathering, even if you don’t actually know all the other players beforehand. An orchestra is a state, a chamber ensemble is a family. And it is always interesting to see which combinations of musical and human personalities will give sparks. The string quartet is actually a singularity, with a huge repertoire, and a highly developed sense of perfection. Therefore the string quartet repertoire has been more or less conceded entirely to the domain of professional quartets. Perfection in itself is of course a good thing, but there is a risk that the playing becomes predictable when one has worked together for 30-odd years. On the other hand, when players do not know each other so well, the result could be less predictable, in a good sense. So a festival like this is a golden opportunity to pick up the non-quartet chamber repertoire. Some of these works are true pearls, and in certain special cases they can surpass the same composer’s string quartets. For example, the Brahms piano quartets and quintets, as well as his string sextets, are at least as good as his string quartets. Don’t get me wrong, I really like the Brahms quartets, they are very good – especially the 3rd quartet with the viola solo, haha. I also want to mention the Mozart (viola) quintets, they are a special treasure. And the Schubert (cello) quintet, of course. And then there is the piano trio, also with a considerable standard repertoire. But this combination of instruments is not so homogeneous, so the advantage of a fixed partnership is less obvious, and it is a bit easier to put together a decent piano trio from three good individuals. DVS: So, within the context of such an ad-hoc festival ensemble, do you sense a special role for the viola player? I’m sure there is! But I’m so used to this role, I have little reference for comparison to the other instruments. I did play the violin quite a lot in the past, but it was almost always viola for chamber music. I simply love the sound of the viola, it has something eternally attractive to it. It’s got a Mona Lisa duality, both joyful and melancholy at the same time. That ambiguity fascinates me, and it is very well suited to the music of Mozart and Brahms. Those two particular composers certainly knew how to employ the viola in their music, and that is no coincidence. A cello often plays high in its own register, like an operatic tenor, showing off. The viola is drawn to the deep end of its own register, it is more introverted, its base character embodies ambiguity and tenderness. DVS: But your own viola is definitely not of the modest kind… how did you find it? Tomter with his 1590 Gasparo da Salo. I had spread the rumour that I was looking for something grand. I had my mind set on an original Brescian instrument, preferably one of the “nameless” (and hence affordable) ones. But then I came across this one, a Gasparo di Salo from 1590. So it had a name, and a price. There was a long and exhausting search for a private sponsor who would help me to get this viola, but at long last I was fortunate to get help from Selvaag (a major Norwegian enterpeneuring company, red.). DVS: So you were very determined to have this instrument? This was exactly what I was looking for. It is a big instrument (44.5cm), which suits me physically. Such a size gives you something extra, it has all I could wish for in a viola: Depth, power, sonority, and evenness in range. Oftentimes in a viola you have to choose between depth and high range, but this instrument has both, it doesn’t choke. It is a very complete viola, the best I’ve ever experienced. DVS: Is there an explanation for the remarkable increase in the number of internationally renowned violists in general, and from Norway in particular? The overall level of viola playing has improved a lot in the last decades. Some pioneers have acquired technical skills far beyond what had previously been thought possible for a violist. In their time, Tertis and Primrose set new standards for viola technique. The virtuosity attained by Primrose is probably unsurpassed to this day, he was in a way the Heifetz of the viola. I must also mention Peter Schidlof from the Amadeus Quartet, a unique violist with a voice that I never tire of listening to. In modern times we see a considerable number of viola soloist careers: Nobuko Imai, Kashkashian, Bashmet, Tabea Zimmermann, and many others. In the last decade we have also seen an improving level of viola playing in Norway, and a few artists have actually made themselves noticed. Those successful musicians spring from a solid culture of string teaching. Names such as Eivind Ringstad, Ellen Nisbeth and Ida Bryhn. Oslo Philharmonic lead Catherine Bullock is an example of excellent musicians drawn from abroad, strengthening the viola community in Norway. DVS: Who was most influential in your musical development? I’d have to mention all of my teachers, mostly violinists. I started out in Hamar with the violin teacher Michael Oustad, a wonderful guy, who was great at teaching children, that’s very important. Next I came to Leif Jørgensen, it was with him that I started playing the viola. I made my debut recital in the Aula (an Oslo concert hall, red.) when I was 17, mostly a violin programme, but also one piece on the viola. Later on I continued my studies with Max Rostal. After this I went back home for a few years, during which Leif Jørgensen helped me to a teaching position at Godlia (Østlandets Musikk-konservatorium). I was then asked to play the Bartok concerto with the Bergen Philharmonic. I was about 20-21 years, I had never before played a viola solo concerto, I had barely even heard the piece, but I accepted the challenge and went to buy the sheet music. At least I had almost a year to prepare for it. During this time I also got involved in a string quartet, and entered some competitions. I ended up studying with Sándor Vegh for 2 years, and from then on I only played the viola. In terms of influences, I learned something from all of the good players I met. Technically I feel that violin and viola are fundamentally the same, I can do both quite easily. But nevertheless I’m very much a violist – the viola is “my” voice, just like every singer has a voice of his own. DVS: We talked about the viola repertoire earlier. You have arranged several pieces for viola yourself, for example “Fratres” by Arvo Pärt. How do you approach the adaptation of repertoire from other instruments? You have to be critical, it is very much a case-by-case consideration. The “Fratres” transcription was in fact approved by Pärt himself. This piece is a bit of a special case, because there are already so many transcriptions. But there was a violin and a cello version to work from, and that made it even easier. I have also recorded the César Franck sonata for viola, which also already existed for violin and cello – that makes it a natural choice. And the Grieg cello sonata, which works very well on viola, maybe even better than the original. As for concerto repertoire, I have recorded the Bach double concerto for violin and oboe (BWV 1060, red.) for viola and bassoon, and the Mozart clarinet concerto for viola, which was transcribed shortly after Mozart’s death (1802). The latter recording (Simax, Norwegian Chamber Orchestra) also features a viola quintet version of Mozart’s famous clarinet quintet. DVS: There are many examples of the connection between the viola and clarinet. Not only do they share some repertoire (e.g. the Brahms sonatas) but they also regularly appear together, for example in trios with a piano (Mozart’s Kegelstatt, Bruch’s Eight pieces). Yes, I suppose this is because they have roughly the same range. The Brahms sonatas were produced in both clarinet and viola versions from the start. DVS: It looks like there’s a steady increase in the production of new works for the viola, both as a solo instrument and in chamber ensembles. Is the viola becoming a favourite instrument for contemporary composers? It is true, and there are two clear reasons: One, there are more strong viola soloists around commissioning new works. I’ve done so myself. And secondly it is exciting for a composer to write for an instrument that still has unexplored possibilities. And at any rate, the viola has many more options for sound production than most wind instruments. It is matched by the violin and cello in this respect, but as a solo instrument, the viola has been standing in their shadow until recently. DVS: Would it be appropriate to speak of a viola renaissance? DVS: And then the inevitable question: Do you think there will ever be a Norwegian Viola Society? Now that we have established a first cooperation with Eivind Ringstad’s recital at our congress in September, it would be very useful to keep this connection alive with some structure in Norway. That is a very good idea. I have in fact tried to encourage some of my colleagues to start such a thing, unfortunately I have no time myself. The young British violist Rosalind Ventris is quickly emerging as one of the most promising artists of her generation. 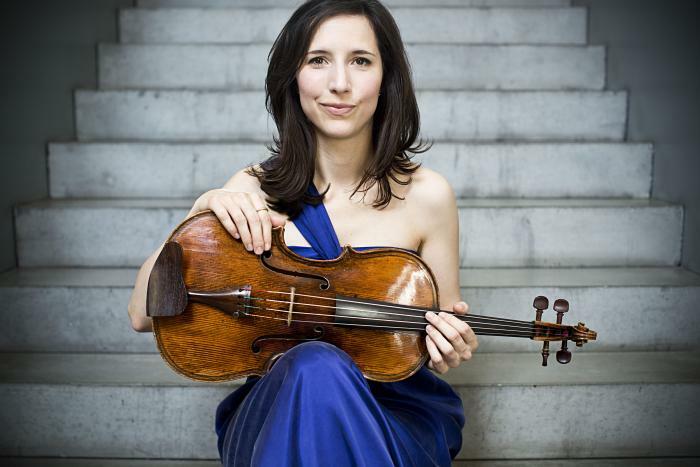 At 17, she was the youngest competitor at the 2006 Lionel Tertis International Viola Competition, where she won the prize for the most promising British entrant, and the EUCO prize. She made her London concerto debut the following year, performing Hindemith’s Viola Concerto “Der Schwanendreher”. 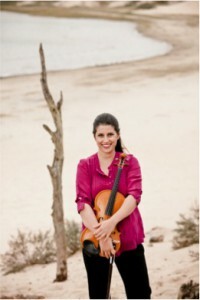 Rosalind is currently based in London, giving concerts throughout the UK, and abroad. This month she visits The Netherlands with recitals in the Concertgebouw and in Den Hoorn (Texel), with works by Hindemith, Roxburgh and Bowen. DVS: How did you get started on the viola? I started learning the violin, and then took up the viola as well aged eight. I played both till I went up to Cambridge University to read Music and at that point only wanted to practise the viola! At the very beginning I played a violin strung as a viola, and then a small viola by the Scottish maker Thomas Hardie. After that I played a wonderful viola by Andreas Hudelmayer which is very light. Having taken up the viola at quite a young age, I was very lucky to have access to good instruments which didn’t cause me any serious physical strain. 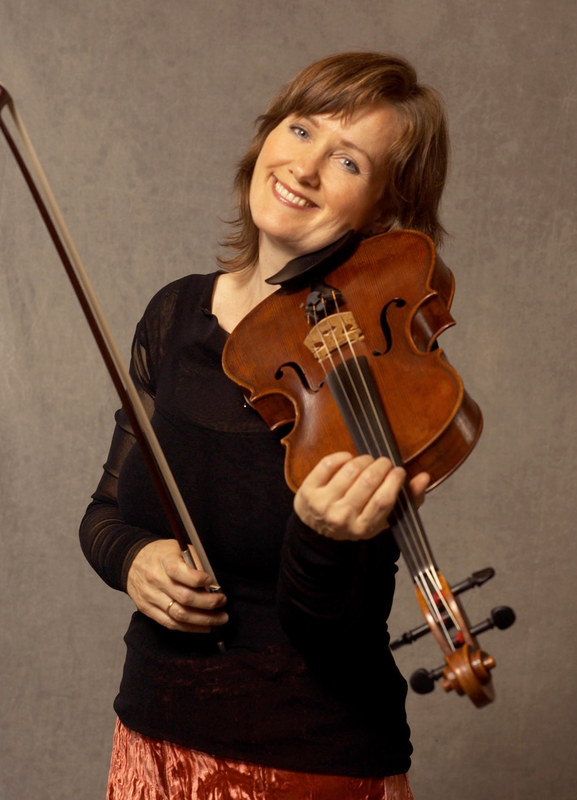 DVS: What made you decide to become a professional violist? DVS: Your favourite musical advice? Wow, there have been so many! One of my favourites: ‘Practise with your brain, perform with your heart.’ David Takeno. DVS: Most memorable viola moment? Playing my first solo recital at the Wigmore Hall last October, it really is a magical hall. DVS: How do you experience the difference between performing solo repertoire (Concertos, solo recitals) versus chamber music? Do you have a preference? I don’t have a preference; I just love playing the viola! I’m amused that some people still don’t think of it as a solo instrument though. It’s sometimes said that the repertoire is ‘limited’, but there is great music written for the viola (and, of course, excellent arrangements). It’s just a matter of discovering this music, if you have the curiosity and want to. You learn so much from playing with other people, both through things you talk about, and just playing together. When everyone gets along it’s really very fun too! I’ve learnt so much from rehearsing with Lara Dodds-Eden and my flute, viola, harp trio, Trio Anima. As a soloist with orchestra life is a little lonelier, but you’re still collaborating with a group which has its own sound which is very exciting. You have to have definite ideas about any music you play, but you have to be especially clear when playing a concerto. Playing a recital completely on your own is something has its own unique demands – for obvious reasons! DVS: We almost forgot to ask about your viola…! I’m very fortunate to be playing a wonderful brothers Amati viola, made in 1619, which has been leant to me for this tour. It has an absolutely gorgeous mellow chocolatey viola sound! DVS: Musicians and composers from Great Britain spearheaded the renaissance of the viola in the late 19th / early 20th century, with great names such as Lionel Tertis, Frank Bridge, York Bowen, Rebecca Clarke, Britten, Vaughan Williams and many others. How is this heritage visible in British music institutions today, particularly for violists? There’s a lot of British viola music played by composers like the ones you mention today, but it’s a shame that this repertoire is not more widely known within the UK. In my experience, it seems that even the Rebecca Clarke Sonata, which I’ve performed many times, is not really known by the general public. I think that all of the music colleges here have recently had a viola festival of some description and from what I’ve seen or heard of a good deal of early twentieth century repertoire is played at such events. We also have the Lionel Tertis International Viola Competition and Festival on the Isle of Man, which is one of the few international competitions exclusively for the violists. DVS: How are classical musicians affected by the economic crisis in the UK? DVS: What are your personal near term goals and prospects? My goal is always to try and play with all the depth and sincerity I can. I’m playing in Aldeburgh at the end of next month, and very excited to be part of the celebrations of Britten’s centenary this year. I’m really looking forward to be taking part in the IMS Prussia Cove Tour later in the year too. Esra Pehlivanli voltooide haar muziekstudies met onderscheiding aan het Staatsconservatorium in Ankara en vervolgens bij de altvioolvirtuoos Michael Kugel aan het Koninklijk Conservatorium Gent en aan het Conservatorium Maastricht. Ze won prijzen op prestigieuze concoursen zoals de “Kryzstof Penderecki International Contemporary Music Competition” (Polen) en de “Torneo Internazionale di Musica” (Italië), ontving de Jur Naessens Muziekprijs (Nederland) en de eerste prijs bij de “Premio Valentino Bucchi International Viola Competition” in Rome, waar ze ook een eremedaille uitgereikt kreeg van de president van Italië. Esra Pehlivanli treedt veel binnen Nederland op (Concertgebouw Amsterdam, Concertgebouw Nijmegen, De Doelen Rotterdam, Frits Philips Eindhoven) en in heel Europa (van Ierland tot Turkije), Zuid Amerika en China. Onlangs heeft Esra Pehlivanli vijf CD’s uitgebracht, met opnames van meesterwerken uit het verleden en nieuwe composities speciaal voor haar geschreven. Naast de uitvoering van de klassieke meesterwerken voor altviool, werkt Esra graag met componisten samen om nieuw repertoire te creëren, en de hedendaagse muziek voor altviool te promoten. DVS: At what age did you first start playing the viola, and how did that come about? When I was 11, I entered the Ankara State Conservatory where I was born, and began to learn how to play viola. The music education system in Turkey is different than in some other countries. There are no music schools that you can go first and later on you decide if you want to become a professional musician or not. You directly start with the conservatory and it takes ten years. Before that I was singing at the children choir of the Ankara State Opera & Ballet House. This was for me the start with music. I enjoyed so much, especially the part when we were on stage performing with full orchestra, soloists, choir, costumes, decors and lights…. I knew I wanted to be a musician and wanted to keep on experiencing such a charming momentum all my life. DVS: Can you tell us any specific “revelations” from your viola studies that greatly influenced your technique and style? I love Kreutzer studies. I think if you are really able to play the etudes, you are a great instrumentalist. You have everything in these studies, all about right and left hand. Vibrato is very important, I learned this from my previous teacher Mikhail Kugel. Not many violists pay attention to that area. Therefore it’s quite common to hear violists with very slow vibrato, as if they are 80 years old! I learned from this viola master not only about vibrato but all about the technique, style and most important how to become a stage performer and musician. DVS: Viola students of today have the opportunity to watch (and learn from) great violists in action on YouTube. Which artists would you particularly recommend studying? I wouldn’t say studying but maybe observing if your purpose of watching is about learning. I like very much to listen to Mikhail Kugel, Yuri Bashmet and Tabea Zimmerman. They are all very different from each other but very unique. I also find it very important to watch or listen to not only violists but many other instruments as well. We can learn so much from music, it doesn’t have to be specifically viola music. I always believe, music develops your playing technique very much (I don’t mean for beginners). Therefore I’d always recommend to listen to every musician which gives you pleasure and make you feel something. DVS: Which qualities do you seek first and foremost in a viola (for your own use)? I don’t have very big hands, therefore for me the size is important so I can hold it and play it comfortably. But of course the sound is very very important. I have to have a connection with the instrument. It’s a piece of wood, I give life to it. It has to be a special connection between the instrument and the player. I like very much if the viola has a dark sound on the low strings and not so sharp A string. Viola has a great range, this we must hear in the instrument. Therefore the balance between the four strings is very important too. I use a heavy violin bow. This is very good to play for recitals, chamber music and solo concerts. You can do many things much easier than with the viola bow. More and more viola players are choosing this type of bows. If you haven’t tried it yet, I’d advise you to do so. DVS: Your play in ensembles with some unconventional instrument combinations such as accordion, pan flute, recorder, percussion. How does this differ from the “usual” viola partners such as the clarinet, the piano, and the string quartet? Until now I performed in many different chamber music settings and it always requires different attention on tuning, sound production, vibrato, breathing… I have four ensembles where I play regularly: Duo MARES with accordion, Black Pencil (which we reviewed last month, ed.) with block flute (recorder), panflute, accordion, percussion, Trio Kybele with a mezzo-soprano and piano, and the Duo Pehlivanli & Safonova with piano. Viola has a wonderful range, which can fit into any kind of chamber music ensemble. It has the middle register, warm sound, not so high as violin and not so deep as cello or contrabass. This opens a lot of doors to combine it with any instrument such as in ensemble Black Pencil. Viola with blockflute, panflute, percussion, accordion? It is really unique and actually difficult to combine. Every time I’m trying to find a way to melt better with those instruments. They do as well, this is chamber music. For example, if we have a slow unison motive and I play it with my full vibrato, it doesn’t work that well. The pitch changes, I have to find a way to combine it, little slower and smaller vibrato. So I get closer to the wind vibration. Same as if you play with clarinet. Intonation is another issue. When you play with piano, you know that there is one well-tempered instrument and you have to adjust your intonation into that instrument, whether it is good or not, you have to. But playing with instruments where there is no fixed pitch, then the intonation becomes relevant. To play with accordion is the same. I have to be extra careful with my intonation. The tones changes with the bellow change, with the register change, and it’s a wind instrument. It’s difficult for me to tell, because I’m quite a moody person. Although I like very much Walton, Schnittke concertos, Hindemith’s works with orchestra and of course Mozart Sinfonia Concertante and Bruch double concerto. DVS: Every cellist’s “school orchestra trauma” seems to be the Pachelbel “Canon”. What is the most infuriatingly annoying viola part you’ve ever had to play? There are many unfortunately (!) I wouldn’t like to name it for respect to the composers. DVS: Speaking of repertoire, would you say that contemporary composers are more aware of the viola than their predecessors, in general? Definitely! Viola is the instrument of today. It has not been discovered enough until the second half of the 20th century. In my opinion it also comes from the players’ abilities. Today’s violists are much better than 50 years ago. We can inspire composers better, and they know that viola is no longer an accompaniment instrument but can perfectly be a solo instrument too. It is the performers’ duty to improve the instrument, if the composers are still writing a relaxed viola part, we have to push them to write it without limits. There are no limits to improve and do it better. At least this is how I think all the time. I like very much new music and the collaboration with the composers, to create it, perform it, to receive a score that no one has played before, and afterward leave it to everyone. This is a great process. DVS: Is there a viola “community” in Turkey, and do you see a Turkish Viola Society arising in the (near) future? Well, you just gave me a great idea! There is a big unofficial viola society in Turkey. It just needs to be organised. Why not, maybe in the near future. DVS: What are your expectations of the Dutch Viola Society, in practical terms? What could it do to help you as a professional violist? There are many violists living or based in The Netherlands who are working in the orchestras or performing as a chamber musician or soloist from all ages. We should have a better infrastructure to come together, share ideas, knowledge, and repertory. This can be organised as conferences or broadly oriented festivals. The website is great and of course we are living in the social media times. Maybe it’s not a bad idea to add a page where you mention the new CD recordings especially from the Netherlands. One of the things I wanted to do is to create an online catalogue for the contemporary viola repertory. Maybe we can work on this topic together. The DVS can occasionally commission new works to Dutch composers, there are many interesting people around. Networking is very important in order to enlarge our Dutch Viola Society. Altviolisten in de wereld zijn er in vele soorten en maten. Elke maand zal onze eigen razende reporter en bestuurslid Kristofer G. Skaug iemand de hemd van het lijf vragen over de altviool en meer! Deze maand trappen we af met niemand minder dan altiste Ásdís Valdimarsdóttir! De in Amsterdam woonachtige IJslandse altiste Ásdís Valdimarsdóttir studeerde altviool aan de Julliard School of Music in New York bij Paul Doktor, Felix Galimir en het Juilliard Quartet, en later in Detmold bij Nobuko Imai; medeoprichter van het Miami String Quartet; van 1995-2003 lid van het Chilingirian String Quartet; speelde in verschillende kamerorkesten zoals de Deutsche Kammerphilharmonie Bremen, het Chamber Orchestra of Europe en het Ensemble Modern; hoofdvakdocent aan The Royal Northern College of Music, Manchester; en sinds kort ook bij het Koninklijk Conservatorium in Den Haag. Zij is ook als docent verbonden aan de jaarlijkse Internationale Masterclasses in Apeldoorn voor jonge kamermusici. DVS: Tell us something about the beginnings of your viola training on Iceland? 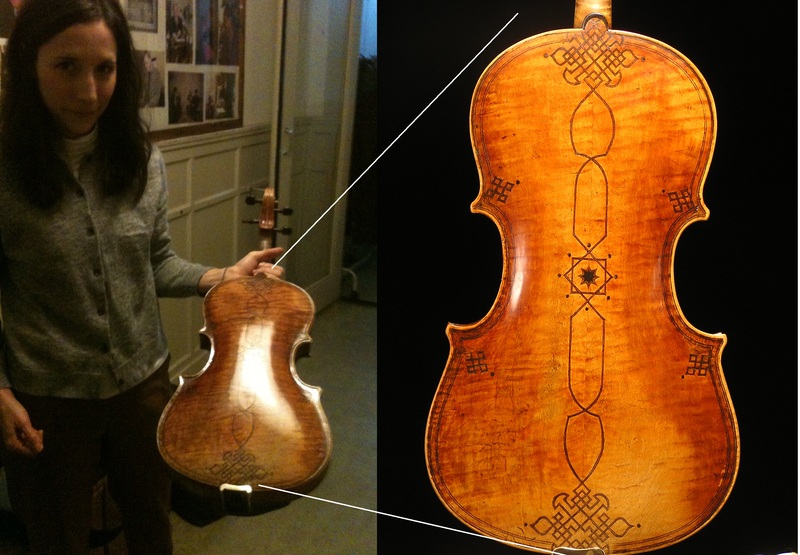 I started on the violin… there are not very many people in Iceland (300.000) and very few played the viola. I had never heard the viola being played in a solo capacity until one day when I was walking in the hallway of the Reykjavík music school when I was about 14 or 15. I heard this amazing sound coming out of one of the rooms – so I opened the door and found out it was coming from a viola! An Icelandic woman called Unnur Sveinbjarnardóttir, who had left home to study in Germany with Bruno Giuranna, was preparing for a recital with a local pianist. From then on I knew I wanted to play viola. When I finally told my violin teacher I wanted to change completely to viola, she told me I was ruining my life!! After that it was a bit tricky because there was no viola teacher at the school! So I had some lessons with members of the Iceland Symphony, listened to as many recordings as I could get my hands on and managed to get away to the Juilliard school in New York when I was 18. DVS: Are there more musicians in your family? Only one other professional one- my sister Lilja. She plays the French horn in the Iceland symphony. She is a few years older than me and was a big help in my early musical development. DVS: At which point did you know you wanted to become a violist? I think I knew straight away when I started violin that I wanted to be a musician- a very strong instinct that I never doubted somehow. When I found the viola – as told above – I felt like I had -come home- in a way, or found my voice. DVS: What was the single most valuable viola playing advice you have ever had? Actually that one came from an American oboist, whose name I have forgotten, who was obsessed with overtones! He was one of those people who need to talk a lot- and wanted to tell me all about his theory of how musicians of all genders and instruments need to think more about letting the natural over tone series ring on their instrument. So for viola this means to not give more pressure with the bow- or try to put more weight on the string when you want more sound, but in fact the opposite! In other words allowing your strings to vibrate as much as possible produces a much bigger sound than pressing and squashing your string. You can actually see the oscillations on the string if you observe what happens when you press too hard and how much wider the string swings from side to side when you don´t press. This is even more important on a viola than a violin or a cello because of the acoustic size problems. DVS: Tell us about your instrument. How did your paths cross, and what do you see as its finest qualities? I play a viola by Otto Erdesz, a Hungarian man who lived and worked in Canada. He was married to Rivka Golany and made her ´cut away´ viola. I found it many years ago through Andreas Post. I had asked him to let me know when he would get a great sounding instrument that I would be able to afford into his shop- so one day he called me up and told me about this one. I was living in Germany at the time, but I went to pick it up and promptly got a bank loan! I have played it ever since, and it has managed to survive – when I was in the Chilingirian Quartet next to two golden period Strads- and next to many other great old instruments I have had the good fortune to play next to. It is definitely a male! Very strong and robust and usually does what I ask … Sometimes I wish for a more elegant instrument- but one can’t have everything!! DVS: What are your favourite viola solo pieces? and chamber music? DVS: What was your most memorable viola moment? Is this one a joke? As in when I walked on stage without my bow? (a pencil in my right hand!) Or if you mean it seriously – perhaps playing the York Bowen fantasy [viola quartet] with Isabella van Keulen, Esther van Stralen and Béatrice Muthelet at the Delft Chamber Music Festival a few years ago was a really memorable viola moment! DVS: Have you had any association with the Icelandic Viola Society (Víólufélag Íslands)? Is there a characteristic viola culture on Iceland, compared to other countries? I have been away from Iceland for so long now – and when I left there were hardly any viola players at all- even the small viola section in the orchestra was mostly non Icelanders who were there for a short time then. But luckily this has changed and in fact there is indeed an Icelandic viola society. They even had a congress there a few years ago – but unfortunately I was in the middle of a quartet tour and could not go. I hope there will be more activity there in the future. DVS: Do you have any expectations of the activities of the Dutch Viola Society, in practical terms? I hope it will be very active at promoting viola music in general- and in particular prove all the viola jokes wrong!! Thankfully that is already happening. The standard of viola playing is really getting higher – I really believe that the same technical standard should be demanded of viola players as violinists and cellists. A viola society can only enhance the profile of our wonderful instrument – the soul of the string quartet! Het non-profit promotie, organisatie en informatie - platform voor iedereen met passie voor de altviool!